Also known as Premier Multivox, this New York-based company used several DeArmond pickups, including a number of different versions of the DeArmond model 2000. This example of a Model 2000 variant was fitted in a Premier Bantam guitar. The white coil former projects above the metal casing, with no fixing screws visible. The front face of this particular pickup can be seen in some photos of Les Paul’s prototype guitars in the early 1950s, and particularly in the iconic photo of him sitting astride a very large Les Paul guitar. 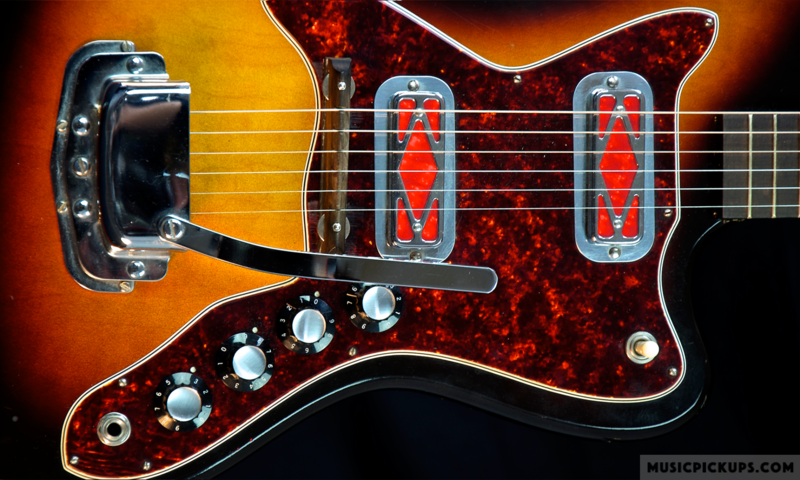 The 1950s guitar above is fitted with two variations on the Model 2000 pickup, in that the coil former extends to the outer edges of the pickup frame. Also, the bridge pickup’s metal frame is a one-piece pressing, whereas the neck pickup’s frame is wider and is a separate piece. This Premier Bantam guitar is fitted with one standard DeArmond model 2000 at the bridge and one different version of the model 2000 at the neck. A Premier solid body scroll guitar with two Model 55 pickups on timber bases (photo copyright Dave Carness, USA). This pickup with an integral chrome bezel was fitted in a Premier Multivox 1960 Bass. This same pickup was fitted in the Harmony H22 and H22/1 Basses and others. (photo copyright Larry Lee). A 1960 Premier Multivox Scroll Bass with a pickup as fitted in the Harmony H22 Bass (photo copyright Nova, of Nova Music, Rincon, Georgia, USA. ).